After two games the DODGERS are number one. It’s nice to be writing on my blog again. I missed all my very good friends. I don’t know what happened but I stopped writing!! Last season was one of those seasons that was wonderful and yet frustrating. I sat in the Baseline section most of the time. I enjoyed it so much I decided to give up my front row seat this season. I found out that my season seat had gone up $5.00 a game which adds up to over $800. I was upset, of course. Everyone thinks my reaction to that price hike was weird. I decided to buy season seats in Baseline. I want to go to Spring Training but I have a class that I have to go to that pretty much took care of my leave that I had planned for ST! I can still somehow go for a couple of days. I am keeping a close eye on Spring Training. I already have some strong opinions but I’ll save those for later. Off season has been very long. I can’t wait until the season is underway. I have a new camera, a new seat, and big expectations for my Dodgers. Please forgive me for disappearing and stop by again. I love you all and thank you again for your support. Sorry I haven’t posted for a while. I’ve had a few things I had to do….like work! The Yankees series has been a revelation. The problems that the Dodgers have seemed to have has become worse. The question is how can we make the Dodgers a winning team? Unfortunately good talent costs money and the Dodger owner (whoever that may be at thiis moment) are not willing to spend any. The Dodgers need pitching help: starting and relieving. We have only Kuroda, Kershaw, Padilla and Billingsley. Bills is just coming off DL. Ely and Monasterios were called into action simply because there was no one else. Troncoso is not as good as he was last year. Sherrill is still a nightmare. Whenever I see him coming on the field, my stomach goes into contortions. Hager is now a memory since he was finally DFA’d. Kuo, Weaver and Belisario are the only relievers that are reliable. Kuo has TLC written all over him because his arm is brittle. Everyone was excited about the Yankees Series. I was dreading the crowds. The Dodgers have not been playing very well this month, so I just hoped that they would not be swept. I just was hoping that our guys could make it through the Series with a win. My week was busy, starting out with work, work, work. Then I decided to get a new Iphone. Liittle did I know that I would be standing in line for 6 hours. Two days later, the phone kept telling me “No SIM card.” It now works and I love it. Would I stand in line again for 6 hours. Nooooooo. There were a few interestingl things about the Yankees series. Number one was seeing Jane of “She Fan fame. Jane Heller is one of my favorite people anyway. She looked great. Her blog is of course, http://janeheller.mlblogs.com. Another positive was, of couirse, seeing my friends at Dodger Stadium and also making new friends. One of my seat partners was a nice young man from Canada named Austin. He looked like a Dodger prospect. He told me he was a left handed pitcher in school until he injured his shoulder. One thing that bothers me at the games are the #$%^&& beachballs. There were at least 4 that bounced on me or around me. Why would anyone bring a beachball to a baseball game? Billingsley and Sherrill combined to bring the Dodgers to a humiliating loss to the Angels. 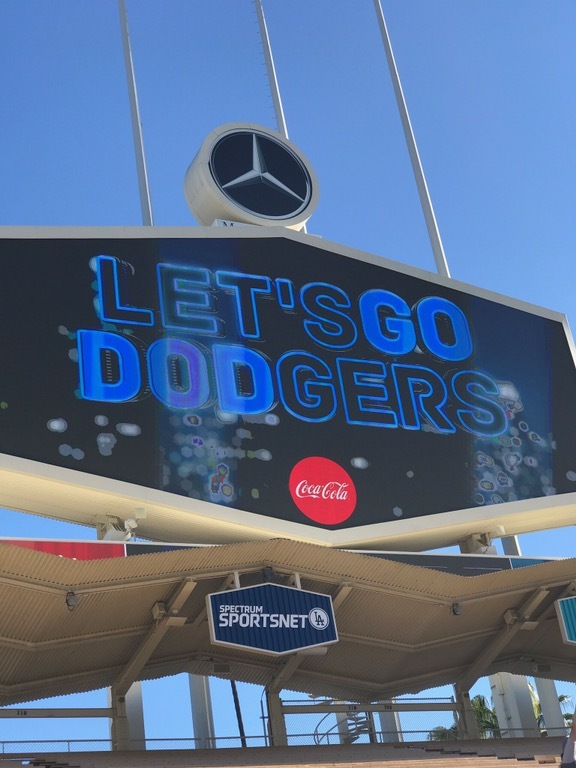 The score of 10-1 was one that made Dodger fans cringe and hope that April wasn’t back again. I am forever an optimist and Pollyanna so I just chalk it up to the doldrums after a day off. At least the food was great! The Ranchero potato salad had a delicious ancho zing to it. The black bean and corn salad was the best and I can’t say enough about that Caesar salad. The fare was Mexican with beef fajitas, ancho encrusted turkey with herb sauce, refried beans and Spanish rice. Good food always puts me in a better mood. Bills actually looked like the new and improved Bills but he wasn’t so sharp. Russell seemed to get on base but never all the way around. Blake DeWitt can finally unpack his bag. He won’t be sent down to Triple A again. I’m waiting for another Matt Kemp homerun. I was also waiting for Casey Blake to hit another long ball. It’s the third annual Think Cure weekend which includes a radiothon, telethon and auction. I bid on a couple of items hoping to win them. I’ll let you know. Several doctors and nurses were honored on the field for their work and research. They all threw out the first pitch. Before the game, Matty and Casey were joking around with Torii Hunter, a good friend of Matty’s. The great Hideki Matsui who hit a 3 run double. Don’t you miss him, Jane? Finally the last run into the Dugout. I think I spent most of the game with my blanket over my head or up in the Baseline Club getting more food. I’ll look like a blimp if the Dodgers don’t start winning again. The Dodgers are now back to being tied for first place with the Padres who scored two runs in the bottom of the ninth in their game with the Mariners to win. Those Padres just can’t seem to stop. Tonight will be another game with the Angels, the second in a 3 game series. I have my fingers crossed that John Ely can pitch well. There is talk that Vicente Padilla will soon be back but no one is in a hurry since Carlos Monasterios is doing so well. My big question was why did Joe Torre bring Sherrill out with a winnable 1-4 score? I would’ve liked to see red hot Kuo to make the final out. 3 runs later, I’m sure everyone is shaking their heads, mine was under my blanket after that. Sherrill was dismal before going on DL with a lack of confidence. Now his ERA is 7.80 after walking Abreu. Thanks for stopping by. I did have fun last night, eating, talking to my friends, and taking fantastic pictures. The victory last last was spurred by a 2 run homerun by Manny Ramirez and four hits by first base James Loney. The Dodgers are now one full game over the San Diego Padres who were rained out in New York. Sherrill, seen on the right, is off DL. Belisario, out of the bullpen, has been amazing. The performance by the bullpen has been one of the keys to winning. Here is a shot of the bullpen running back in after batting practice. Clayton Kershaw has had super starts. Russell Martin smiling. He is relieved that the 3 year old girl who was hit in the head by his batting practice foul ball is doing well. He is planning on visiting her and giving her a big hug when she feels better. He will not talk about whether he will pay for her surgery saying that that is a private matter. The Dodgers were able to get the better of Adam Wainwright who allowed eight hits and five walks. There was a scare in the ninth inning when Molina hit a two out ground rule double which both Matt and he tried to catch with Andre hitting the right field wall. Andre was very slow getting up. It’s good that neither player caught the ball or the Cardinals could have scored. Andre is probably sore today. Luckily today is a day off. One item of good news: Andre Ethier’s brother Devon was signed in the 32nd round by the Dodgers as pitcher/outfielder. Andre describes him as being his opposite: an Ethier who won’t give the staff any problems. Andre happens to be one of the nicest guys in the Dodger organization, by the way. It’s funny. When they play “Iron Man” and open the gate to let Broxton out, it’s like they’re letting the bull out of the pen. He’s very big and scary. Note the difference in size between Russell who is average height and Broxton. Broxton got his save but made the game exciting allowing that Pujols basehit and the Molina two out ground rule double. Today is a day off which is good. They played their longest homestand..13 games in a row without a day off. When they play again, it will be a series against the Angels. The Angels always play well at Dodger Stadium so it should be a nerve wracking series. Tonight I will be going to work. Then I will be ready for more Dodger baseball. Thanks everyone for your prayers for the little girl. Stay pumped up until the next game. How fitting that last night would be the night that the Dodgers took over sole possession of first place in the Western Division. It was also a night of amazing eating. The salad was wonderful. It consisted of the pasta salad, a delicious tomato and red onion concoction and the famous Caesar salad. The deep fried turkey was so good that many went back for more. It was served with french fried sweet potatoes and herb grilled vegetables. Also included were cheeseburger sliders. It definitely was one of the best fare I have had. I tore myself away from the buffet table in time to see Andre out on the field stretching. A woman standing next to me kept saying that they were out there teasing everyone. I suppose she meant that the players were that close to us. Andre in a quiet moment. The lady standing next to me was saying “What is he doing? Praying?” in a loud voice. I have to admit she was a little over the top with her comments. Chalk it up to being overexcited about being this close to the players. Andre has not hit a homerun since coming off the DL with a fractured right pinky. His batting average has been .188 since coming back. Last night he did well hitting three for four. It was a pitcher’s duel between Chris Carpenter and Hiroki Kuroda. There were 7 scoreless innings. Kuroda-San pitched better than he has in quite a while. It was exciting watching two fanastic pitchers. Here is Kuroda-San throwing out his first pitch. But the hero of the game was Manny Ramirez who hit a double in the 8th inning finally batting in Raffy Furcal. Still waiting. Although Manny doesn’t have the bat he used to have, he still causes other teams to scramble when he is up. Andre on first base. Note he is not wearing his cap. Russell running to Broxton to have a discussion. Broxton has been lights out. Andre always jumps over third base when he runs in. I wonder if that is one of his superstitions. Watch him during a game. Hong-Chih Kuo had the win after pitching a scoreless 8th inning. Kuroda-San was absolutely wonderful. Broxton was Broxton with the save. Tonight will be the last game of a 3 game series with the Cardinals. Kershaw will be pitching for the Dodgers, Wainwright for the Cardinals. It will be another game with two amazing pitchers. It turns out that the foul ball that hit the 3 year old girl during batting practice was hit by Russell Martin. She had to have surgery after suffering a depressed skull fracture. Russell has offered to pay for the surgery. I know he feels terrible about it. Prayers for the little girl and her family. Again, I implore all parents, watch your children, especially in the field sections. Don’t take your eyes off the ball,, ever. Thanks for stopping by. Have a great baseball day! Tomorrow we are going to Claim Jumper Restaurant to claim our buffalo wings. The score tonight was 12-4. Anytime the Dodgers score 10 runs, the fans are treated to chicken wings. The hero of the game was Blake DeWitt who was responsible for 5 runs, one being a 3 run homerun. Carlos Monasterios has suddenly become the fifth SP for the Dodgers. His record is now 3-0. Suddenly everything is falling into place. Here is a pic of last nights hero, AJ Ellis. He caught tonight as well. He said that there is nothing as scary as having Matt Kemp charging you after a win. They don’t call Matt Kemp bison because he’s a little guy. Raffy Furcal warming up. He finally seems to be healthy again. Blake DeWitt before the game. He grew up rooting for the Cardinals. Our fantastic bullpen. John Link did a fantastic job tonight. He may be sent down again when George Sherrill comes back from DL. Charlie Hager is on DL again with a sore right big toe. Before the game, the Dodgers and Cardinals were yakking it up. Man, something is in my cap! Time for a pitching change. Monasterios pitched a fantastic 6 innings. Moments before the Dodger win. The Dodgers are still 1/2 game behind the Padres who can’t seem to lose. The Dodgers and Padres have the best record in the National League. During batting practice, a 3 year old girl was hit on the side of the head by a foul ball. It knocked her off her feet. She is at Children’s Hospital. Please pray for her and her family. And please everyone, if you bring your little ones to the ball park, watch them closely and do not let them stand alone when the ball is in play. Tomorrow’s game with the Cardinals will be Jonathan Broxton bobblehead night. Yaaay. I will be sitting in Baseline again. So I will be eating in the club . Can’t wait. Hopefully the Dodgers still have some offense left. Pitching will be scary. Chris Carpenter will be pitching for the Cardinals. Thanks everyone for stopping by. You always make my day.